The Bulls and Bears MT4 Indicator are two indicators that are designed to show the underlying strength of the current trend. 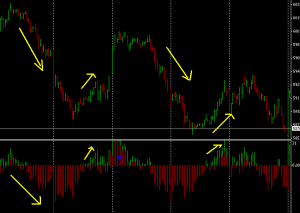 On the chart below you can see I have added both mt4 indicators to one indicator window. You don’t have to do this but I find it easier to look at this way. To apply both indicators to one window you add one indicator and then drag the other one into the same indicator window. I selected the “Bears” indicator to be red and the “Bulls” to be green. You may also need to set the the ‘fix minimum’ and ‘fix maximum in the custom indicator settings box so that they are the same for both indicators. This will line up the indicators so both centre lines are in the same place. As you can see it is quite straight forward. When the bears out weigh the bulls the histogram will be mainly red and below the zero line. And when the bulls have the strength the indicator will show mainly green above the zero line. As the arrows show the changes from one to another line up nicely with changes in trend. However, you sometimes (based on how I added the indicators) see the red above the zero line but notice that if the green is greater the bulls win the battle, as shown by the ‘question mark’. 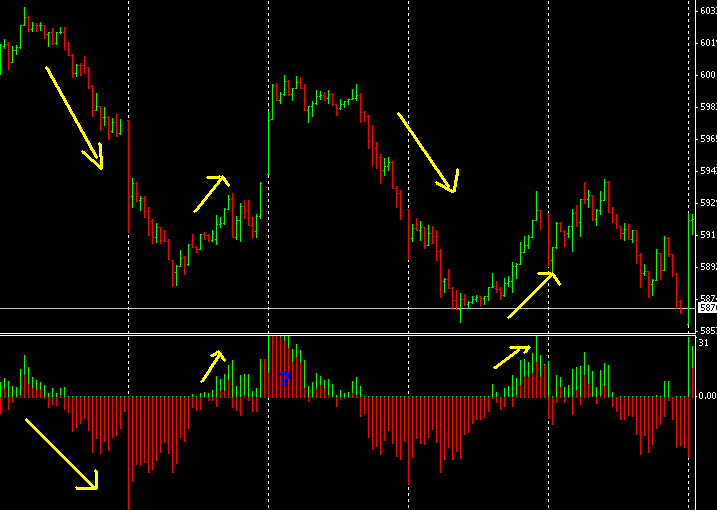 They are very straight forward mt4 indicators to read. I think this type of indicator suits the discretionary trader more than the mechanical trader and allows room for interpretation but are decent enough trend indicators in their own right. There are indicators which have combined the two indicators and show a combination of the two but I think it is quite good to see what is happening to both indicators. If you make the bull lines wider than the bear lines you will be able to see the bull lines below the zero/ center, behind the bear lines. Thanks for the idea about lining these up. To explain a little more, it helps if you add the Bull indicator then write its Fix minimum and fix maximum numbers down, then add the Bear indicator, check both fix min and fix max boxes and enter the numbers from the Bul lindicator. In my case the numbers were -0.0027 and 0.0054. Will take a look of your settings. Thanks for the post. Thanks. It was helpful to learn about overlapping both the bulls and bears indicator. Is it possible for you or Craig to elaborate more on the Fix minimum and fix maximum numbers in reference to using it as a leading indicator? I also saw the download links to the indicators. Aren’t these available by default under the custom indicators in MT4 or am I missing something? Indicators may well be under default for some people. Maybe not for others. Either way they are free.